Part 2: Thought there’s a pool party! 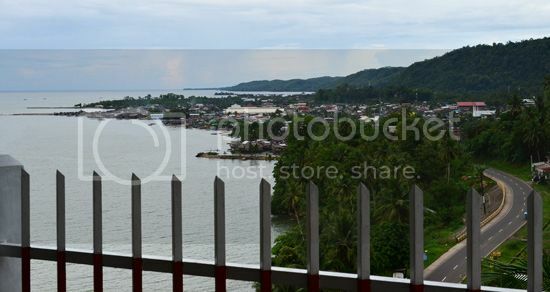 Shortly after our ocean view breakfast at Bislig Boulevard we drove for about 40 minutes taking Hinatuan and Tagbina Highway and upon reaching Dugmanon junction in Brgy. Cambatong in the town of Hinatuan, we finally saw the sign, -- Welcome to enchanting Hinatuan. The road from the highway to the river is not cemented yet, but it’s wide, well scraped and maintained. The river is still 12 kilometers away from the highway and the ride was bumpy and rough with steep swings and occasional sharp bends. If you’re taking the habal-habal, you better get a good grip of your driver; it sure is a tough ride. Just a side note here. The downside of having a private ride is that, it limits you from dealing with the practicalities and instinctiveness of traveling. You’ll also have little interaction with the locals, which for me faintly defeats the purpose of traveling. Anyway, had I not been traveling with children, I could have gone for the long shot and do what travel bloggers do - road mapping, hotel plotting and itemizing expenses of the trip. 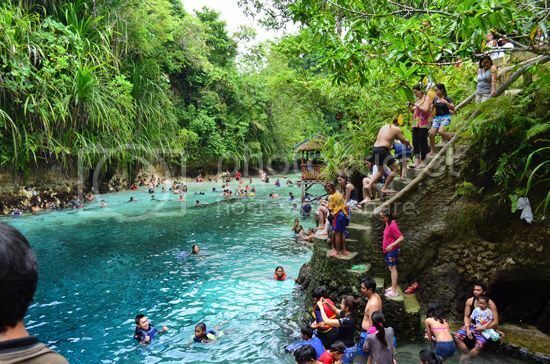 But since the author is just a tourist this time, who came down here to see what is there to see, I suggest you read Pinoy Adventurista’s practical guide to commuting to enchanted river. He has a handy guide how to get there in one piece, lol. This is a part of the road shoulder they quarry to I suppose, use the soil to pave the road. The peeps on board find it like a place in Petra, hahaha, so we stopped and took photos. It took us about 25 minutes to finally get down to the bank. 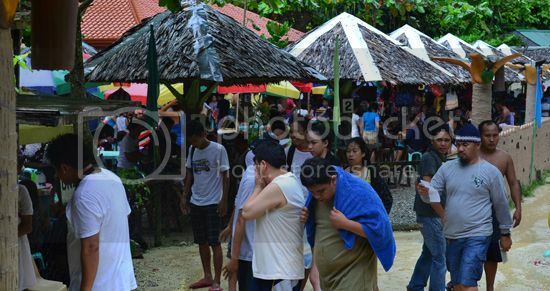 It was raining when reached there and my, my, if I may borrow the words of Pinoy Adventurista, mayor has a pool party and I wasn’t informed about it. Hahaha. 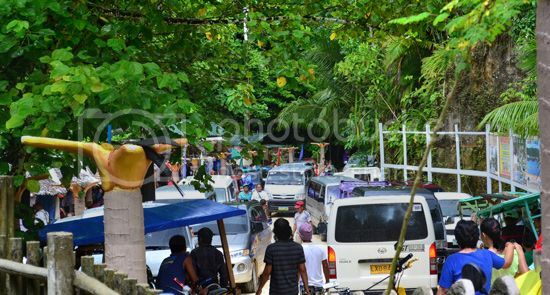 There were countless vehicles parked along the picnic entrance and the cottages were all occupied. I didn’t know I have to reserve for a hut, well, I didn’t anticipate the crowd would be this thick either, that’s why I didn’t bother at all. Thanks to our lady driver who frequents this place. She fostered quiet a good connection with the operators here and know some point persons around. 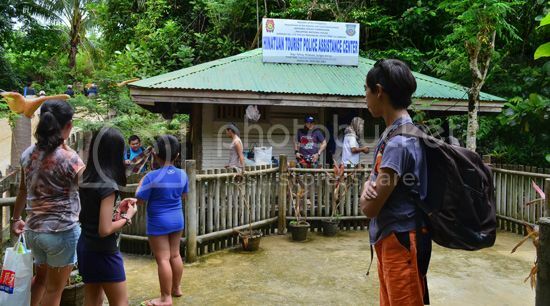 Luckily, we were given a place next to the tourist police outpost, oha! Good vantage view of the partying peeps below. Indeed, the pictures in the internet didn’t deceive me. It truly is enchanting, magical and I’m beyond awe. 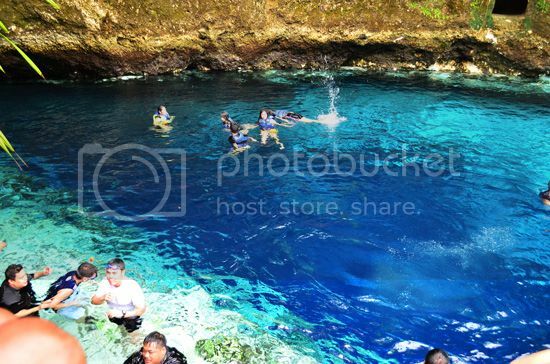 The water is crystal clear with a mysterious deep blue background. It’s like as if someone has thrown a bucket of aniel in there. I wonder how did it come to be this blue? Amazing! There were human traces everywhere and if I’m the diwata in charge of watching this river, I would be very angry, unless the diwata is a party peep herself and understand the fact that it’s only this time of the year that most of these people have the time to come and appreciate this exceptional natural beauty she holds responsible of. There are many folk stories about this river; all evolve around metaphysical and supernatural tales. Well, Science can always come up with an explanation why this is so, but this alchemy of nature is just so strong and so mysterious that will leave everyone in reverence and in wonder. 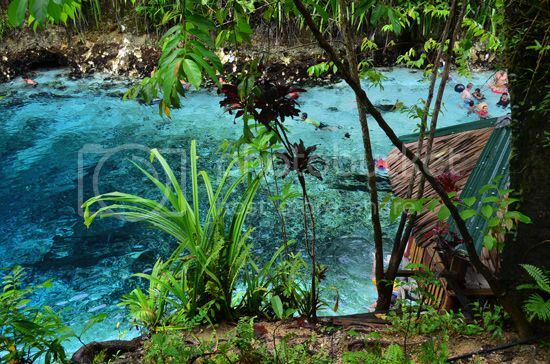 It’s precisely the reason why it’s named enchanted river. 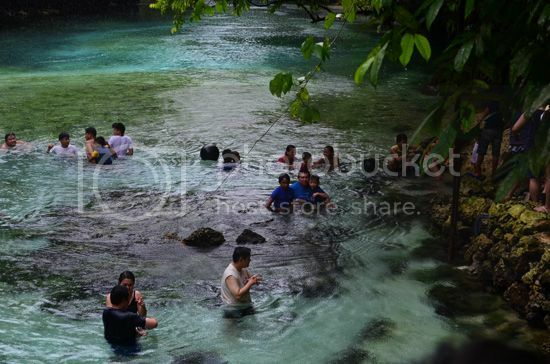 Well, it wouldn’t be a complete enchanted river adventure without having to experience its enchanting water. I’m not confident with my swimming skills, and the kids are getting rowdy with excitement so we descended on the not-so-deep part of the river, the end part up to where the tourists are only allowed. From the other bank, it really looked like there’s a pool party going on. People in luminous orange life vest are everywhere; we even made friends with some foreign tourists. The current is tolerable and the water is saline. I thought rivers have fresh water, well, this and many other things add up to the mystery of this river. At 12noon, the bell rung and everyone got out of the water. It’s a ritual the Manong in-charge here does to feed the fishes in the river. From where I stand, I can’t see the actual feeding, it’s quiet far but stories have it, they’re big and colored fishes. There’s also a classical music being played on the background while they do the fish feeding ritual. The music is not for the fish I figured, but for humans to arouse connection with nature. We had our lunch with a good view of the sopping people down. We stayed until about 2 in the afternoon. I chatted with some people working with the local government running the operation. Most of the people around this area have abandoned their farms with scanty produce and work with the river operation. Here, they got steady income. 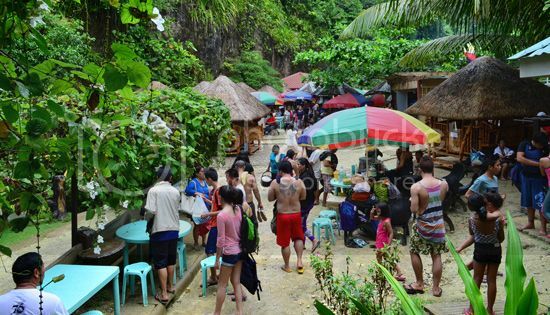 At the onset of the river touristy, Mang Nelson earned PhP75 a day as Tanod. 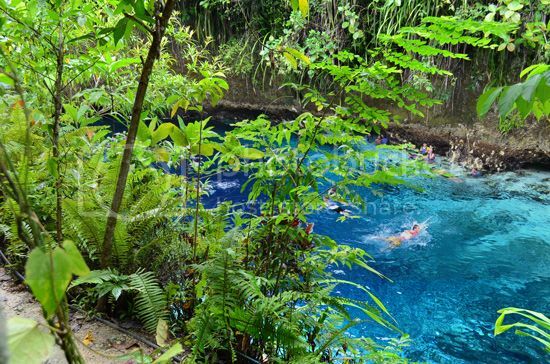 Thanks to social media and travel blogs, enchanted river is now one of the sought after tourist destinations here in Surigao del Sur. It has attracted a number of visitors from all over the world that somehow propelled the economy around here. 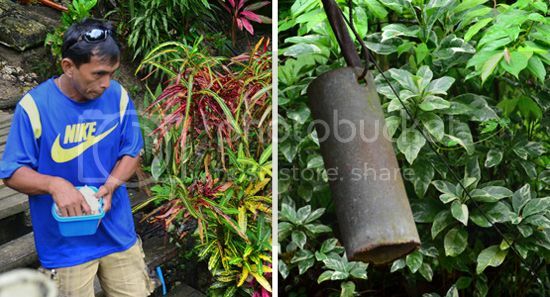 Now, Mang Nelson is receiving PhP100 a day, a little enough amount to feed his family. Even van services, habal-habals, skylabs have greatly benefited by this enchanting wonder. I really hope that everyone, wherever they may come from that they will do their part in preserving and conserving this natural treasure. This is our legacy to our children and to our children’s children. We should protect it by exercising what we learn from our schools and homes about environmental protection. The kids won’t get out of the water. 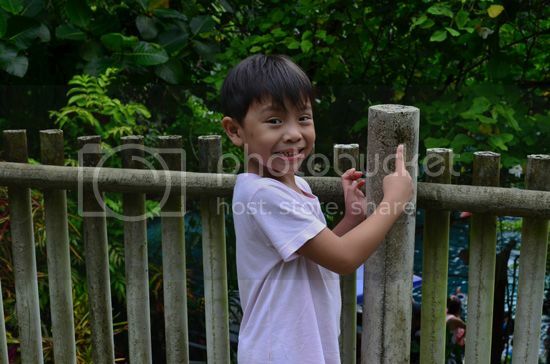 And since we still have to travel to Britania in San Agustin I have to force them out and concoct a horrible story …. 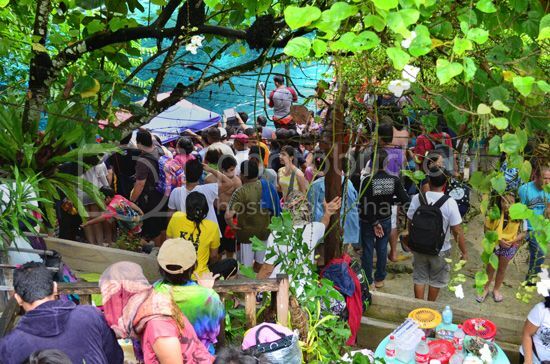 ‘you know, the diwata has declared, all children that came from Davao must get out of the water now or she’ll cry blood and turn the river red.’ Da lagi, nanghawa! Hahaha! 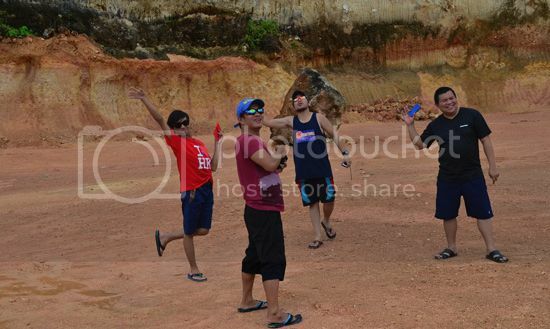 And so we drove up north again and headed to Britania, San Agustin, Surigao del Sur. What we’ve found out here charmed us forever. So check back for my next post, or better yet, subscribe to my blog not to miss the latest. Thank you very much.